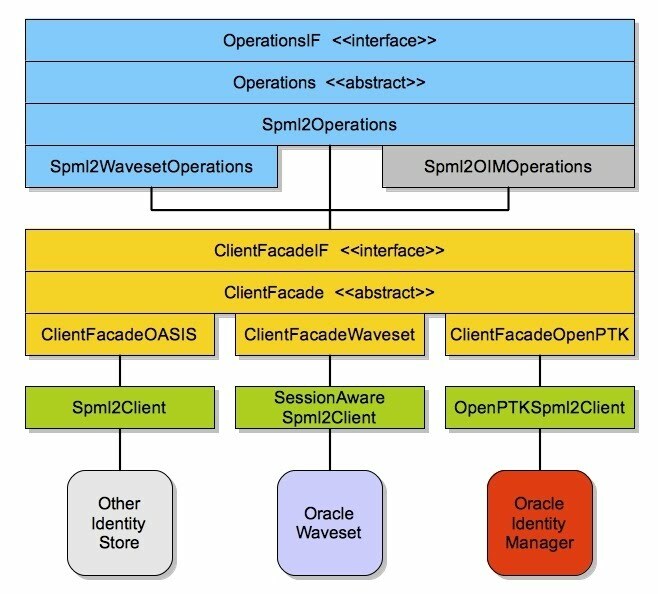 A service was created for OpenPTK which was tested against Oracle Waveset (formerly Sun Identity Manager). This service uses the Oasis OpenSPML2 java library. This service met the needs of integration with Sun Identity Manager, however, several issues were found when testing this with other vendors SPML2 servers. These issues were related to the oasis openspml2 implementation. Due to these issues, extending the openspml2 to enable configuration changes of the default behaviour is being considered. The Spml2Client is the "main" class/interface that Java developers use to implement SPML2 functionality. The default JDK (OASIS), available here, may not meet vendor specific requirements. A vendor may extend this class or change how the class is used. When the Operations class initializes, it will look for a property called client.classname. The class must implement the ClientFacadeIF interface. The Operations instance will create an object using the classname then call the class's init() method. The SPML2OIMOperations class uses the ClientFacadeOpenPTK class to access the SPML2 Client implementation. The SPML2WavesetOperations class uses the ClientFacadeWaveset class to access the SPML2 Client implementation. The openspml2 toolkit will be added to our repository. This will provide a baseline for a version of the toolkit that we will maintain to add some configuration setting to the api which are not possible without our own codebase. We will attempt to contribute all our changes back to the community in order to integration the configuration enhancement for others. This is primarily to support a specific vendors implementation of SPML2. The plan is to make the changes configurable through an openptk service in order to coexist with the current spml2 service implementation. This will initially be the oasis code, then the changes to allow the configurability we need will be added on top of it. The oasis openspml2 source is CDDL based so we will need to include the license for that, which I will do. We are also required to leave the headers in the files we modify and add additional comments for any changes, which I will do. OpenPTKSpml2Client.java Client implementation which will call all other openspml2 apis. This class should be used instead of the default Spml2Client class. It supports the same "methods" so it should work just like the other class. There was no value in "extending" because too many internal methods needed to be changed. Merged logic that was in Spml2Client and SimpleSOAPClient into this one class. The class assembles the required vendorX SOAP Header and SOAP Body sections. It uses the setUser() and setPassowrd() methods (or constructor) to obtain the user data, which is used in the SOAP Header. In addition to "wrapping" the SPML2 Requests with "<m:processRequest...>" This class has to also unwrap a returned "<m:processRequesstResponse>" XML Element. If this is not done, the XML Marshallers fail because they are expecting a "pure" DSML/SPML2 payload. "<env:Envelope xmlns:soapenc="http://schemas.xmlsoap.org/soap/encoding/" xmlns:xsd="http://www.w3.org/2001/XMLSchema" xmlns:env="http://schemas.xmlsoap.org/soap/envelope/" xmlns:xsi="http://www.w3.org/2001/XMLSchema-instance"><env:Header></env:Header><env:Body env:encodingStyle="http://schemas.xmlsoap.org/soap/encoding/"><m:processRequestResponse xmlns:m="http://xmlns.oracle.com/OIM/provisioning"><modifyResponse xmlns="urn:oasis:names:tc:SPML:2:0" status="success"><pso xmlns="urn:oasis:names:tc:SPML:2:0"><psoID ID="Users:21"></psoID><data xmlns="urn:oasis:names:tc:DSML:2:0:core"><attr xmlns="urn:oasis:names:tc:DSML:2:0:core" name="Users.User ID"><value>BCHILDS</value></attr><attr xmlns="urn:oasis:names:tc:DSML:2:0:core" name="Users.Key"><value>21</value></attr><attr xmlns="urn:oasis:names:tc:DSML:2:0:core" name="Users.Last Name"><value>Childs</value></attr><attr xmlns="urn:oasis:names:tc:DSML:2:0:core" name="Users.First Name"><value>Jenny</value></attr><attr xmlns="urn:oasis:names:tc:DSML:2:0:core" name="Users.Xellerate Type"><value>End-User</value></attr><attr xmlns="urn:oasis:names:tc:DSML:2:0:core" name="Users.Creation Date"><value>2009-10-14 10:28:58.0</value></attr><attr xmlns="urn:oasis:names:tc:DSML:2:0:core" name="Users.Updated By"><value>1</value></attr><attr xmlns="urn:oasis:names:tc:DSML:2:0:core" name="Users.Update Date"><value>2009-12-07 15:20:02.0</value></attr><attr xmlns="urn:oasis:names:tc:DSML:2:0:core" name="Users.Status"><value>Active</value></attr><attr xmlns="urn:oasis:names:tc:DSML:2:0:core" name="Users.Disable User"><value>0</value></attr><attr xmlns="urn:oasis:names:tc:DSML:2:0:core" name="Users.Lock User"><value>0</value></attr><attr xmlns="urn:oasis:names:tc:DSML:2:0:core" name="Organizations.Key"><value>1</value></attr><attr xmlns="urn:oasis:names:tc:DSML:2:0:core" name="Users.Role"><value>Full-Time</value></attr><attr xmlns="urn:oasis:names:tc:DSML:2:0:core" name="Organizations.Organization Name"><value>Xellerate Users</value></attr><attr xmlns="urn:oasis:names:tc:DSML:2:0:core" name="Users.Provisioned Date"><value>2009-10-14 10:28:57.0</value></attr><attr xmlns="urn:oasis:names:tc:DSML:2:0:core" name="Users.Change Password At Next Logon"><value>1</value></attr></data><capabilityData xmlns="urn:oasis:names:tc:SPML:2:0:reference" capabilityURI="urn:oasis:names:tc:SPML:2:0:reference" mustUnderstand="true"><reference xmlns="urn:oasis:names:tc:SPML:2:0:reference" typeOfReference="memberOf"><toPsoID ID="Groups:3"></toPsoID></reference></capabilityData></pso></modifyResponse></m:processRequestResponse></env:Body></env:Envelope>"
"<?xml version="1.0" encoding="UTF-8"?><modifyResponse xmlns="urn:oasis:names:tc:SPML:2:0" status="success"><pso><psoID ID="Users:21"/><data xmlns="urn:oasis:names:tc:DSML:2:0:core"><attr name="Users.User ID"><value>BCHILDS</value></attr><attr name="Users.Key"><value>21</value></attr><attr name="Users.Last Name"><value>Childs</value></attr><attr name="Users.First Name"><value>Jenny</value></attr><attr name="Users.Xellerate Type"><value>End-User</value></attr><attr name="Users.Creation Date"><value>2009-10-14 10:28:58.0</value></attr><attr name="Users.Updated By"><value>1</value></attr><attr name="Users.Update Date"><value>2009-12-07 15:20:02.0</value></attr><attr name="Users.Status"><value>Active</value></attr><attr name="Users.Disable User"><value>0</value></attr><attr name="Users.Lock User"><value>0</value></attr><attr name="Organizations.Key"><value>1</value></attr><attr name="Users.Role"><value>Full-Time</value></attr><attr name="Organizations.Organization Name"><value>Xellerate Users</value></attr><attr name="Users.Provisioned Date"><value>2009-10-14 10:28:57.0</value></attr><attr name="Users.Change Password At Next Logon"><value>1</value></attr></data><capabilityData xmlns="urn:oasis:names:tc:SPML:2:0:reference" capabilityURI="urn:oasis:names:tc:SPML:2:0:reference" mustUnderstand="true"><reference typeOfReference="memberOf"><toPsoID ID="Groups:3"/></reference></capabilityData></pso></modifyResponse>"
The version of the spml2 libraries used in the build must be selected based on whether OIM or SIM is used. All operations except search will coexist. In order for search to work properly, the correct SPML2 library must be used. The ant build process has been extended to allow the command line build process to specify which SPML2 library to include. See Issue 153 for additional details. For Other development builds (Netscape project), the correct SPML2 library must be included in the openptk.war file which is built.